Today is not the actual birthday of Dr. Martin Luther King jr., but it is the day that his birthday is celebrated in the United States as a national holiday, so we will take this occasion to consider an aspect of King’s thought, but only by way of an unlikely digression. The fact that one becomes what one is, presupposes that one has not the remotest suspicion of what one is. From this standpoint even the blunders of one’s life have their own meaning and value, the temporary deviations and aberrations, the moments of hesitation and of modesty, the earnestness wasted upon duties that lie outside the actual life-task. One recognizes in this passage many of the familiar devices that Nietzsche uses to shock the reader into thinking for himself, to question not only the conventions of society but also to question the conventions that one tacitly sets up for oneself. Such questions must be asked if one is ever to become what one is. Complacency spells the end of all becoming. One would not say that Dr. Martin Luther King jr. was a Nietzschean figure. 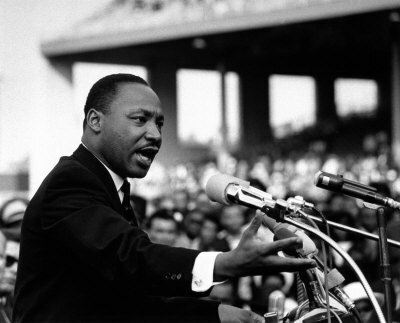 He had to have been energetic and driven to achieve what he did achieve, but King was apparently sincere in his Christianity and African-American Christian churches and traditions were central to the civil rights struggle in the US. King belonged to a very different intellectual tradition than Nietzsche. Indeed, it would be interesting to know in detail what figures like King and Gandhi thought of Nietzsche, if they ever expressed themselves on the topic, and it is amusing to imagine how Nietzsche might have characterized or even caricatured men like King and Gandhi. Despite the chasm between King’s Biblically-inspired thought and his American-inspired rhetoric and Nietzsche’s classically-inspired thought and European rhetoric, however, I see at least one common thread: becoming what one is. Expressed morally, to love one’s neighbor and to live for others and for other things may be the means of protection employed to maintain the hardest kind of egoism. This is the exceptional case in which I, contrary to my principle and conviction, take the side of the altruistic instincts; for here they are concerned in subserving selfishness and self-discipline. Thus, even in Nietzsche himself, becoming what one is and becoming what we are would seem to be integral developments. Now for a step even farther afield. There is a figure in Buddhist thought known as a Bodhisattva. In Mahayana Buddhism (less so in Theravada Buddhism) a Bodhisattva is a partially enlightened being that chooses to delay its own attainment of ultimate enlightenment in order to conduct others on the path to enlightenment. I am fascinated by the very idea, and I cannot think of a similar conception realized in any other tradition. But that does not mean that we cannot appropriate the idea of a Bodhisattva for our own thought. In the context of becoming what one is, figures like King and Gandhi are secular Bodhisattvas who have taken a non-egoistic path, delaying their own opportunity to become what they are, in order to guide communities toward becoming what they are, and, in so doing, the Bodhisattva and the community so guided together become what we are.